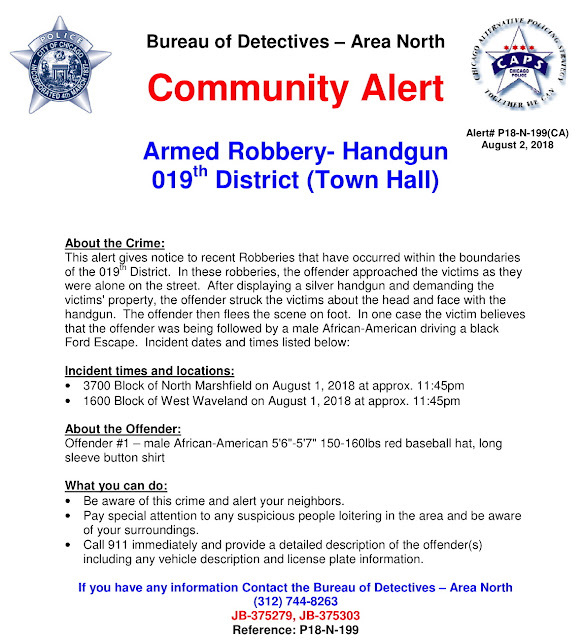 Two armed robberies late Wednesday in Lakeview were the work of the same offender, according to a police source and information in a new community alert. In separate hold-ups, the gunman approached victims while they were alone on the street in the 3700 block of North Marshfield and the 1600 block of West Waveland. After displaying a silver handgun and demanding the victims' property, the offender struck both victims in the head and face with his firearm, police said in the community alert. CWBChicago reported on Thursday morning that one of the robbery victims was a pizza delivery driver. The robber may have been assisted by an accomplice who followed him in a black Ford Escape, according to police. The robber was described as a black man in his mid- to late-20’s who stands about 5’7” tall. He was wearing a red hat and an unbuttoned flannel shirt, according to the alert and previously-reported information. Anyone with information about the robberies is asked to call Area North detectives at 312-744-8263.